Comments Off on Costa Rica moves to close its zoos, coca and alcohol used in Incan human sacrifice, and Usain Bolt’s superhuman abilities. CONICET scientists have developed and field-tested potatoes resistant to Potato Virus Y (PVY), which causes losses of between 20% and 80% of the crop depending on the severity of the infection. Field tests concluded that there was no PVY infection in the genetically-modified plants, while among those not modified, the rate of infection was 60-80%. Regulatory tests required by Argentina’s Ministry of Agriculture, Livestock and Fisheries to commercialize the transgenic potato are being carried out by the company Tecnoplant-SIDUS SA. Costa Rica, known for its national parks, has decided to convert both its zoos into cage-less botanical gardens. 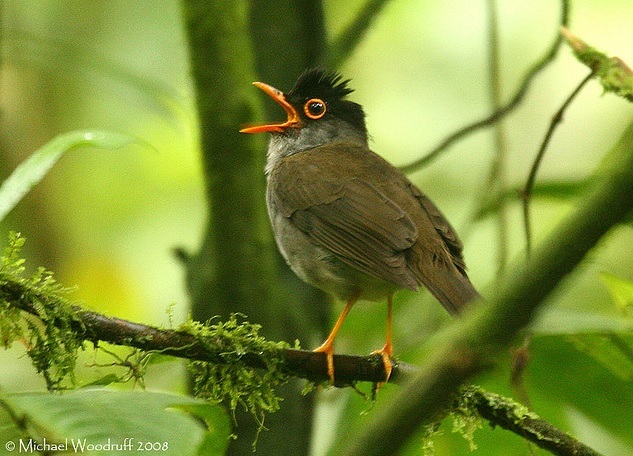 Above, a blackheaded nightingale-thrush in Braulio Carrillo National Park. Credit: Michael Woodruff via Flickr. A survey conducted by the National University of Cuyo has confirmed the existence of a 26-kilometer-long path that could be an Incan road that runs through the valleys in the Argentine province of San Juan. The study was done by combining satellite imagery, field surveys and other archaeological evidence. Railroad construction workers stumble upon an archaeological site in Sao Paulo state, Brazil. The World Health Organization has awarded Colombia for becoming the first country in the world to eradicate river blindness, an infection caused by a roundworm that affects 25 million people worldwide. The fossil of a 130 million-year-old plesiosaur has been found in Colombia. Colombia has reported more than 15,000 cases of malaria so far in 2013. The Costa Rican Ministry of Environment has said it intends on transforming its two zoos into cage-less urban botanical gardens. Animals that can not be released into the environment will be relocated by NGOs. The decision is, according to one minister, “to increase environmental awareness in Costa Rica, which does not want to see animals caged.” 30% of Costa Rica’s territory is protected national parks. Laser measurements made at the Beijing Olympics determined that Usain Bolt ran at 44 km per hour. Using this and other data, Mexican scientists have conducted a study that concludes, among other things, that the enormous amount of effort Bolt developed in 2009 and the amount that was absorbed by friction, is truly extraordinary. UNAM scientists are trying to develop bone tissue from stem cells taken from the dental pulp with the aim of resolving dental bone defects. UNAM scientists are studying peptides found in milk that could have vasodilatory properties. The objective is to incorporate the antihypertesive peptides into various dairy products. Incas intoxicated sacrificial children with alcohol & coca in preparation for death, says new study. Uruguay is holding a seminar in August open to the public on transgenic crops and the question of GMO food labeling. Venezuelan scientists are isolating plant compounds that could be used to fight cancer. Peter Taylor of the Cellular and Molecular Pathology lab at the IVIC institute explained that 600 plant extracts were identified and that they then had their anti-cancer compounds isolated.